• OZbedandbreakfast is the only website that offers B&B owners FREE listings! • OZbedandbreakfast has over 860 registered members and growing fast! • OZbedandbreakfast handled over 100 online booking enquiries during the month of June! • OZbedandbreakfast will be launching a new site in the USA on July1, 2002. • The easy accessibility to information that B&B enthusiasts look for. You get a real feel for each property - as good as an on site tour! • Easy search engine and great descriptions of the properties! The pictures are also invaluable!! • The specials give an opportunity for increased value, which in turn allows us to travel more!! Welcome to the eighth edition of OZ-b&b News! Firstly, I would like to take the opportunity to welcome our 106 new Bed and Breakfast members that have joined us in the past 60 days. We thank you for making us the most comprehensive B&B directory in the country! We sincerely hope you start to see the benefits of membership. Don't worry, we have made your life easier as well. There will be one menu choice entitled 'MEMBERS' where you can go to access all our great services, including BBProfiler - your profile update tool. In this issue we will share with you some information on how to best take advantage of keywords offered in BBProfiler. We will also talk a bit about some of our latest media coverage, and our Web Design service that we offer. As usual, we want to hear from you about anything you think we should hear about. One of the new features added to OZbedandbreakfast.com a few months back was the 'keyword' option. This is a very valuable field that can help users find you more easily. This features provides users with the ability to find your B&B based on any word they choose. The keyword search from our homepage looks at your B&B name, city, and region as well as the 'keyword' field in your profile. Therefore, you shouldn't put your B&B name, city or region in the keyword field as this is already checked using the other fields mentioned. The goal here is to single your B&B out from the crowd. Think like a potential guest. What would they be looking for in a B&B. How will they find you? Take advantage of this powerful search field. Simply log-in to our BBProfiler tool and maintain your details. BBProfiler can be found on our homepage at http://www.ozbedandbreakfast.com. Look for the heading MEMBERS on the navigation bar on the left. We continue to promote our site to the Australian public and have been quite successful of late. 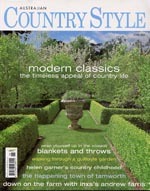 Check out this months Australian Country Style Magazine. A great little article featuring some of OZbedandbreakfast.com's unique styles of accommodation. If you missed our latest coverage in the Herald Sun, June 9th, check out the Press Room for more details. Congratulations to Smoky Cape lighthouse, Cape Nelson Lighthouse and The Old Chapel for their appearance in both media publications. If you have an event or something of interest happening in your local area, feel free to provide OZbedandbreakfast.com with a brief description. Our Marketing Director, Leah, has been working in the publishing industry for ten years and has industry contacts and a database of over 200 Editors and journalists from Australia’s largest circulating magazines and newspapers. Many visitors to the site are very pleased with the offers on display in our HOT $$$ DEALS section. Please feel free to submit your HOT $$$ DEAL by clicking here. You will need to login using you MemberID and password. If you have created deals in the past, please be sure to visit often and update or remove previous deals. If you are an avid traveller, or just love to look at B&B's, why not check out some of the great International Links we have listed on our Links page. You may find some interesting ideas from B&B owners overseas. Alternatively, if you are travelling closer to home, you might find some of the links on our Australian Links page useful. If you have some links you would like to see on our Links pages, please feel free to drop us a note at info@ozbedandbreakfast.com. One of the many services we offer here at OZbedandbreakfast.com is Web site design and development. If you have been thinking about it, or just have a few questions, send us an e-mail. For a one-time fee starting from only $199, you can have your own website with up to six different pages with photos. The fee includes your own domain name (ie: www.yourbnbname.com.au). Elements of the site would include a Home page with photos and contact info., Rooms & Rates, Specials, Attractions, Directions, your logo and much more! That's it for this issue. Thanks again for your support!